Help! English is not my first language! Check spelling and grammar. ALWAYS. Second opinion. Have someone read the article and give you feedback before submitting so you can improve/change it if needed. DO NOT post your article on a petpage for all to see, you'll risk someone stealing your work! If there is something you're uncertain about, ask on the boards. An experienced user is sure to know the answer to your question, whether it's about a character on Neo, or the Neopian Times. Try avoiding the most common topics. Read more below. Lastly, I can't stress this enough: DO YOUR RESEARCH, CHECK YOUR FACTS! Never.. no, ALWAYS check spelling and grammar! Make sure you run the spellcheck in your writing program before submitting. In the world of fanfiction, a beta is a person who reads your story and gives you feedback on it, how to improve it, if you need to cut something or change anything, this includes pointing out errors both factual and in spelling/grammar. Getting a second opinion before submitting your article ensures you deliver the best work possible. Perhaps someone in your family or circle of friends play Neopets? If so, it's a good idea to let them view your draft so they can give you feedback – after all, it's best to ask someone who actually knows what Chombies and Meepits are. You can even write an article together with a friend! If you browse the Neopian Times, you'll sometimes see articles that look like this: My article - also by this other user. Both these users will recieve a prize for the publication. Hooray for working together! To make sure both of you are credited for your work, write in the NT submission form (the box underneath the form itself where you add any comments about your entry) that this article or story was a colleberation between you and the other user. I don't recommend you post your article on a petpage and ask people on the boards to look at it and give you feedback, you'll risk someone stealing your work! If possible, ask someone in RL to look at it before sending it to the editor. Try to avoid over-used/very common topics. If you still really want to write about something that's been done many times before, try to make your article stand out by using a different angle or approach to the topic. Things like gourmet/kad feeding, avatar collecting and lists of pet colours are very common. This doesn't mean your article on this topic won't get in, but you should try going for a different angle. It's wise to search the NT for the topic you want to write about. If there was an article about gourmet foods last week, it's highly unlikely your article about it will get accepted. Try varying your language, don't repeat yourself too much. Look at what or who you're writing about, and think of synonyms or different ways to describe the subject. Say you're writing about King Hagan. He's a king (ruler, monarch, you could also say 'His Majesty'). Fun fact: If you're writing about a King or Queen, they're officially called 'Majesty,' while a Prince or Princess is 'Highness' or 'Royal Highness.' Hagan is also a Skeith (with a beard) and he's known to be quite knowledgable and wise. So instead of referring to him as King Hagan several times in a row, try varying it, for example 'the wise monarch' or 'the ruler of Brightvale'. You can't say that Jelly World exists. It's a long-running joke on Neopets, and you have to go with it whether you think it funny or not. Try to avoid referring to a Neopet as 'it'. If writing about pet colours for example, go with 'he' or 'she' depending on if you think a pet of a certain colour look more masculine or feminine. Also remember that Neopets are not like a house pet. They do for example don't eat from bowls. RL technology such as cars and mobile phones don't exist in Neopia. Neopets use things like boats and bicycles to get around. If you're writing about weapons or the Battledome, avoid graphic descriptions of blood and violence. You can't write about pets in a colour they can't be painted in (check the Rainbow Pool!) or a mix of colours (such as a Baby pet with Air Faerie wings) or a species that doesn't exist, this includes hybrids/a mix between Neopet and petpet, or Neopet and human, as well as creatures with several heads, with the obvious exeption of those already existing in Neopia, such as the Mutant Hissi. Romantic content should be very, very limited. The police and jail/prison should be replaced in your article or story by Defenders of Neopia and dungeons. The NT submission page states that rants are welcome, but if you plan on submitting a thousand word piece on how angry you are that your account got frozen, don't bother. You can't discuss the rules for Neopets or the Neopian Times in an article or story. Thanks to JellyNeo for this information! Check out their site for a complete list of things you should avoid putting in as story, these are just the ones most relevant to an informational piece like an article. Looking for something to write about? Not sure where to start? I recommend writing about something on Neo that intrests you. What do you enjoy on the site? Who are your favourite characters, your favourite species? What games do you like to play? Are you into building a NeoHome or a gallery? Perhaps you're part of a great guild or even a mall? Do you enjoy avatar collecting, or are there any trophies you're aiming to get, or even ones you already got that you're really proud of? Whether you only want a single article/guide/quiz published in the NT so you can get the shiny trophy or if you're aiming for 10 (or more!) submissions to get the even shinier NT star avatar, I hope you'll find this page helpful. I've written about my personal experiences, I offer some tips and guidence and with some work and creativity on your part you'll get that acceptance NM from the editor in no time! Establish what you like about/on Neopets and what you can write about it. Look below for some examples based on different areas of the site. Be aware that some topics are over-done, that is to say there has been lots of publications on the issue and as such it's difficult to get your submission published unless it really stands out. Don't let this put you off from trying, but nonetheless it's a good idea to browse the NT and check if there has been a recent publication of the topic you want to write about. If that is the case, put said article on hold and try something else for now. Neohome and Neogarden – write about your favourite furniture or plants, a guide on decorating for a certain season or holiday, or even turning your neohome or garden into a shrine for your favourite species or Neopian character. Avatars – Ahh, avatars. Everyone loves them, everyone dreams of that special, elusive avatar (*cough*Snowager*cough*) in fact, this guide itself is meant to help you add another to your list! You may write about avies related to certain species/characters/events, lists of the most popular/expensive/sought after avatars, guides on how to get certain avies, or even make a quiz about which avatars suit you the most. Food – a very general topic, but two certain areas are quite popular, and those are Gourmet feeding and Kad feeding. It may be a good idea to try something different. Here are some suggestions: Food and drink items related to petpets or Neopets (such as Aisha Cinnamon Roll) or food/drink that certain species would like to eat, like Bruce may enjoy slushies and snow foods as they're native land is Terror Mountain. Food/drink related to a certain holiday (like spooky foods for Halloween, candy and chocolate for Valentine's Day or the Chocolate Ball). Perhaps pick a few different lands and write about their cuisine? Use JellyNeo's Item Database to look up which food is sold in the different lands, for example Faerie Foods in Faerieland. Maybe try writing a resturant review (like of Kelp in Maraqua) or even a mystery shopper article about certain shops? (You would write about how helpful and polite the staff/shopkeeper are, how the items/wares are presented, if the shelves and floor is clean and tidy, etc). I have written in more detail about the following topics: Pet colours and customisation as well as Famous Neopians and Neopet care below. Your article won't get rejected for having a quick, short introduction, such as 'Aishas are awesome, and in this article I have written about the 10 Aisha colours I think are the greatest. Enjoy!' A couple of my articles have short introductions like that and they were published. I would recommend to flesh your introduction out a bit more, though. This is just my personal opinion. The ending of an article doesn't have to be very wordy or elegant. Say you end your piece about the 10 greatest Aisha colours like so: 'This wraps up my list of favourite Aisha colours. Happy Aisha Day!' It's short and sweet. A little less abrupt ending would be: 'This brings us to the end of the list. I hope you're spoiling your Aisha rotten for this years Aisha Day, and if you don't already own one, I hope this article has inspired you to create or adopt a member of this fine species. Happy Aisha Day!' Which ending do you personally prefer? Look below for the beginnings and endings I used in my own articles if you need more inspiration. Customisation offers endless possibilities. You can dress up your pet in all kinds of different clothing, and with all the lovely backgrounds available, only your imagination (well, also your bank balance at the National Neopian) sets the limit! Certain Neopet species are harder to customise than others, and beautiful though they are, Peophins do fall into this category. Thank Fyora for species specific clothing! 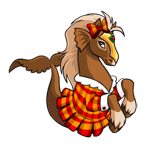 These wearables are all tailor made to fit one certain Neopets body type, which not only means you can make your Peophin look dashing, you'll also get a more unique look than when you have to rely on the clothes found at Unis Clothing Shop or the NC Mall. Many items sold there can be worn by all species, which means your Peophin might take a stroll down a street in Neopia Central and pass by any Aisha, Kacheek and Cybunny wearing the same shirt as them. Awkward. So, this species may be a tad difficult to customise, but in Neopoint clothing there is a nice variety which caters well to both the female and male sides of the Peophin population. That's all, Neopians! I hope you have enjoyed reading my article, and please keep in mind this is all based on my personal opinions and preferences, this is by no means a how-to guide on customising Peophins! I just wanted to tell you about some of the great outfits that are made for this fantastic species, now go forth and celebrate Peophin Day in style! In honor of the day celebrating Meridell's discovery, I have compiled a list of Royal pets I feel are generally overlooked, forgotten and underestimated by the Neopian population. In this article, I have focused on pets that look like they would belong in the medieval land of Meridell, that means no Kikos or Chombies, sorry! Hopefully this list will bring some light and attention to the pets that need it. Enjoy! Which Royal Pets are your favourites, and which ones do you feel deserve more love and attention? Do you agree with my picks? Feel free to Neomail me with any comments you may have, thank you for reading, and have a grand celebration of Meridell's discovery! In honour of Mutant Day, I have written a small list of what I personally consider to be the most monstrous and awesome Mutant Neopets. Enjoy! I hope you enjoyed this article. Thanks for reading, please Neomail me with any comments and questions. Happy Mutant Day! In celebration of the Faerie Festival, I have put together this fun quiz so you can put your knowledge of Neopia's Faerie folk to the test! The answers for each category is listed underneath the last question of each category, to make it less confusing when you're looking to see how many you got right... No peeking, though! I hope you enjoyed this quiz. Happy Faerie Festival! In this article we'll be taking a look at some of the most impressive and interesting Neopets to hail from the Lost Desert. Are you browsing the Trading Post for your Lost Desert Paint Brush yet? Which Desert pet is your favourite? Thanks for reading, please Neomail me with comments or questions. Pirates are feared across Neopia. They sail the open ocean in search of ships to board and plunder for riches. They desire gold above all else, yet they're not just a horde of unrefined hooligans, they're s-k-i-l-l-e-d sailors, capable of navigating the seas better than anyone. For this article I've picked some of the Pirate Neopets that look like they would be the captain of the ship, the leader of the crew. I hope you landlubbers enjoyed this article, cast me a message in a bottle if so! Arr! The – insert number here – best - insert species here – colours! (The 10 best Aisha colours, f. ex). These are very common, and certain pet days it may be harder to get something in the NT due to the popularity of the pet. Be original, choose a different angle! The colour of a paint brush compared to colours of a certain species allows for more variation. This kind of article is very common and a popular writing choice, if yours gets rejected it doesn't mean it wasn't good! Consider writing about petpets instead, or a combination of the two. Such as, if you write a list of Faerie pets, you can list faerie petpets as well. The articles about pet colours, whether they be based on your personal opinion or polls posted on the HC, are the most common kind of pet day article, and as such you may find yours being rejected due to there being "too many good entries this week. This topic is rather used, so my tip for writing this kind of article, is to write about pets/colours that are less common/popular, or go for a different angle. Instead of writing about the best colours, maybe focus on the ones most recently released for a certain species? (Browse the New Features page to look up colours released on previous pet days, but be aware that colours are also released outside of these dates). Or perhaps more basic ones such as Camouflage, Starry, etc. Colours that are generally overlooked. Browse the Rainbow Pool for inspiration! Write about the colours that you like. Tying a certain paint brush colour to a recent plot or event is also a good idea. The Desert Diplomacy event inspired me to write my article Dazzling Desert Pets. Writing about a PB colour rather than one specific species allows for greater variation. Writing about pet colours is pretty easy, so I say go for it! However, you should be conscious of the fact that this type of article is very popular, so there's stiff competition. Neopets are NOT housepets! They don't eat and drink out of bowls, Aishas and Wockies don't use litterboxes, and you (the owner of your Neopet) don't put a leash on your Gelert when going outside. Think less Bambi and Animals of Farthing Wood, and more Peter Rabbit or The Wind in the Willows. They talk and think, they can walk upright, they can read and write, etc. Regarding petpets, however, they should be approached as RL animals. They do for example not talk. Not really into customisation or fashion? You may find it easier to write about if you pick your favourite species! Customisation is a rich source to draw from when looking for inspiration for an article. It can be varied in so many ways! Go by Neopet species, petpet related wearables, worlds (Terror Mountain: Winter/snow wearables) male or female clothing or Altador Cup team gear. Pick and choose! Cross painting is a subject rarely touched in the NT. Care to give it a try? The very first article I got in the Neopian Times was an article about NeoPoint customisation for Peophins, it was naturally written for Peophin Day. I'm not the type of girl who loves to dress up, I never wear make-up or jewelry and couldn't care less about clothes and fashion. Yet I chose to write an article about clothing... Why? Because I adore Peophins! And I wanted to take on a different topic than the usual article about colours so I'd have a better chance at getting my article published due to less competition. There was a great article about Peophin colours in the same issue, and if I'd chosen to write about the same thing, I'm sure mine would have gotten rejected. With my love for the species of Peophin, I didn't really have a hard time writing about their different outfits. Due to this article dealing with NP clothing, I also wrote about how you could only use parts of an outfit and still get a great look, plus I added suggestions for NP backgrounds to best match each outfit. I looked them up on Dress To Impress and chose four base colours to try a selected group of outfits on. I wrote down which clothes went best with which of the chosen colours, both to shed more light on less appreciated Peophin colours and to flesh out the article with more detail. You'll be needing images for your article to show the lovely outfits! Dr. Sloth's Image Emporium has everything you need. In the search bar, type incat:94 (species name) in this case it would look like this incat:94 Peophin. You'll get all wearables with Peophin models used on the New Features page, this also includes general NP wearables which can be worn by all species, though. In choosing which Peophin outfits to write about, I selected the ones I found most pretty or interesting and the ones with most pieces to the set, allowing for more combinations. Despite not caring about fashion, I do love dressing up my pets! If you write about a species you really like, I'm sure you'll put together an interesting article about customisation! Say you want to write about Kougras. Why not look up items (NP, NC or both) related to the home world of your favourite species? In this case Kougras from Mystery Island. (Suggestions for search words: Island, Beach, Tropical). You could write a guide on how to customise your pet to make them feel most at home, perhaps also include suggestions to which colours work best with the Island theme (besides the Island colour itself, obviously). My personal suggestions are White, Brown, Christmas, Chocolate, Orange and Shadow. Spotted and Woodland are good for jungle inspired looks. Cross painting is another type of colour – related article you may want to try. Use Dress To Impress to combine different paint brush clothing on different colours, such as Desert clothes on a Brown Peophin. You can add the image of the finished result in your article! (Thank you Chiara for telling me this!) If you for example want to write about cross painting and wish to highlight some of the awesome combinations you've made, I suggest looking up the clothes (such as Desert Peophin clothes) on JellyNeo and find the image URLs there. Perhaps add the pictures of the paint brushes (in this case, Brown and Desert) as well? Other typical topics for pet days articles are Famous – insert species – and how to take care of – insert species -. I recommend to look at JN's Book of Ages, The Neopedia and the Gallery of Heroes/Villains in your search of information. They are all great sources! If you're writing about a Neopian species, search for them on TCG cards, either by typing the species name (f.ex. Lupe) in the search bar on Neo, or going to JN's Item Database and selecting Trading Cards from the drop-down list 'Is In Category/Shop'. Not all species are featured on TCGs though, such as the newest species: Xweetok, Gnorbu and Ogrin. (Lutaris have two, in case you were wondering). Search for a character in the search bar at the bottom of the page, but be aware that not all Neopian characters have their own article. The gallery of Heroes and Villains is also helpful. JellyNeo has an amazing encyclopedia of characters and lands across Neopia. You can search for a specific character by name, look up a certain species or world. If you for example choose Altador from the drop-down list (hails from) you'll get all characters that are from Altador. You'll discover characters you never even knew about, so take your time and browse thoroughly. Let's say you want to write an article about Kougras. Where to find them, how to take care of them, etc. Or maybe you want to write about certain items related to Kougras. Searching for Kougra in the search bar brings up a nice variety of results. If you want to learn more about the species, click on the basic coloured Kougra (the first result). You'll get a pop-up window with a couple of sentences about them. You can view all species of Neopet by going to Pet Central (via Explore) and clicking on Neopets Popularity. Look up Kougras on TCGs, you'll find some TCGs in the general search result for Kougra. Each card has a little piece of information you may find useful. Browse the pound for the species you want to write about, you can check out their petpage (which will be the default, basic one), this gives you a general idea of what Kougras are like. (Lutaris do unfortunatly not have this petpage template! And they can't be pounded either, so you won't find any Lutaris in the pound). The Lost and Pound site is also a great, quick way to find the species you're interested in. Don't forget to use your imagination to build on what you've learned about the species, but don't ignore the basic facts about Kougras, such as: They're native to Mystery Island. When writing an article about a Neopian species, you can combine several elements. You can for example write about your favourite Kougra items, plus a section on Kougras and how to take care of them. Or famous Kougras plus some general information on the species and their homeland. Use JellyNeos Item Database to look up items related to a certain species. Put f.ex. "Kougra" in the "description contains" box to get items that may not have Kougra in the name. Quizzes are fun! They're entertaining, challenging and interesting. Best of all, they're more than welcome in the Neopian Times. I had my first quiz published in relation to the Faerie Festival, it was a quiz dealing with faeries from across Neopia, testing the users knowledge of the faerie folk. In short, there are two types of quiz best suited for the Neopian Times: Personality and trivia. You can choose to do a "true or false" type of quiz, but in order to meet the minimum requirement of one thousand words, this would need a whole lot of questions! Pets - could be related to one species, or to species originating from a certain world, (such as Bori, Cybunny and Bruce are from Terror Mountain) in which case you could also include questions about said world. Which species of Neopet runs the Meridell petpet shop? Which of the following petpets is NOT from Geraptiku? Ombat, Blugar, Mauket, Tapira, Vacana. Try making the questions a healthy mix of easy and challenging, as people have varied experience on Neopets, and we can assume that both young and older users read the NT. You want them to scratch their heads at some of your questions, not tearing their hair out in frustration! Example of too difficult questions: Which of the following petpets are retired? Or which rarity are these petpets? Who goes around remembering stuff like this? Which species of Neopet are you? As there are over 50 species of Neopet, your quiz should obviously not include an option for each one. Select a group of five or six species, f.ex. This type of quiz requires the user taking it to keep track of their answers as they go, in order to check their result at the end. Therefore you should assign a letter or number to each species. For example the answer behind A relates to Grarrls. In order to make a personality quiz, whether the subject is faeries or Neopets, you need to know the characters you're writing about. Research, research, research! Nimmos are peaceful. Ixis are playful. Jetsams are fierce. Unis are vain. Meercas are tricksters. Aishas and Lennies are intelligent. Gelerts are loyal. Lupes are brave. And no, I did not make up the above, it's information gathered from various places on the site, such as the default petpages and the popularity page. A personality quiz should be made up of questions asking how you'd react in a given scenario. Below I've given some examples based on different Neopets personliaties. Something has happened! A freckled Earth Faerie smiles at you. Hi there! Would you do a quest for me? I need Magic Vial, please. Do you accept the quest? Something has happend! You find 1,000 Neopoints on the ground! You are being challenged to a fight in the Battledome! Do you accept or decline the challenge? You are at Kelp resturant in Maraqua. Your food has been brought to you, but it's not what you ordered. How do you react? A) I command the waitress back to the table and give her a piece of my mind. B) Eat it anyway, I don't wish to make any trouble. C) Politely inform the waitress of the error. How do you think different species of Neopets would have reacted in this situation? Have fun writing your quiz! Try to be funny and make the readers smile, don't be afraid to mix things up with challenging questions, but remember to not make it too difficult! And most important of all: DO YOUR RESEARCH! Have you written an article about pet colours? Go to the Rainbow Pool, select the colour/species you want, and right-click the image. Select copy image URL and paste it into your article whereever you like. No HTML formatting needed, the editor will do that for you! Have you made a customisation on Dress To Impress? You can in fact add it to your NT article! In the 'Sharing' tab, you'll find links to different image sizes. To spruce up your article even more, head over to the Fun Images page to add animations! There's a wide selection to choose from, I used the Royal Girl Uni kissing the mirror for my Forgotten Royal Pets article. To add pictures of items/petpets to your article, look them up in the search bar on Neo or on JN, and proceed the same way with the Rainbow Pool images. Dr. Sloth's Image Emporium is a wonderful tool, use it well! English is not my native tongue either, but I've got 6 publications in the NT so far. If I can do it, so can you! Regardless if you're going for the NT Star avie, just the trophy, or even the exclusive NT Writer avie (available if you get published in an issue that ends in 00 or 50, such as 200, 250, etc), it's all about having fun! If you find yourself struggling, ask someone who speaks English as their first language to help you, perhaps they'll be your beta for future articles/quizzes as well? Look up words in a dictionary whenever you get stuck. You may find yourself expanding your vocabulary in the process of writing, yay! If you're for example writing a list of some kind (for your article) and having problems wording it properly, and/or varying your language.. I have a tip that's actually helped me get going whenever I've felt uninspired or uncertain. At YouTube, look up WatchMojo - they've got lots of entertaining top 10 lists, about everything from films and tv series to historical persons. Not only will you learn something new, you'll hopefully get inspiration to write your article! And if you're fan of animation, I suggest looking up the channel LewToons, it's run by a great guy named Chad who is quite good at expressing his views about everything from cartoon shows to Disney films in an interesting and entertaining way. Just like WatchMojo's lists, listening to his videos may help you in the right direction when trying to word your article. For example, adding honerable mentions to a list is a good idea to flesh it out a bit if you need just a tiny bit more to meet the word requirement. Try not to get too frustrated! Writing for the NT can be challenging, but it's ultimatly about enjoying yourself and using your creativity. If you find yourself bashing the keyboard in frustration or getting filled with despair thinking you'll never get in... it's time for a break. Get up and walk away from the computer for a while, get some fresh air to clear your head or get your mind off Neo by enjoying a film or spending time with friends. Can I have more than one article/piece published in the same issue? No. This happened to me, however, I got a bit of a flying start on the NT avie when both the articles I had submitted got accepted and put in the same issue. This was addressed in the editorial the following week and explained as a slip up on TNTs part. Both articles remained published however, and I got a 2x on my trophy after recieving the two acceptance NeoMails. What happened was that I submitted one article for Peophin Day and a second for Discovery of Meridell Day, I had no idea the two days/events would be combined, I had assumed that on the off chance both articles got accepted, one would appear this week and the other the following week. I got really lucky! They were the two first articles I ever submitted, so needless to say I was filled with joy! Oh, and in case you want to browse the editorial you find the question about this, I put up a screenie for your convenience below. So, as you can see, this is not supposed to happen and I'm sure TNT will do better in the future. A friend and I wrote an article together. I credited my friend by username at the top of the article. Will we both get the trophy even though I was the one who submitted the article? Yes, when two people write an article and you make sure to credit your friend you will both recieve the trophy/avatar/prize. I submitted an article and haven't heard back yet, how long should I wait before submitting again? Whenever I've submitted something, I've waited up to two weeks before hearing back, it depends on how early you submit, I suppose. (If your article is for a specific day or event). Once you've submitted, there's no need to do it again unless your work gets rejected on the "too many good entries" basis. If so, try again next week or the one after that, unless your entry was meant for a certain day. I got a NeoMail from TNT saying my article is being held over and considered for future publication. Does this mean I'll get in the Neopian Times? Cool! There's a good chance your article will in fact make it into the NT, congratulations! One of my articles was being held over for several weeks before I got the mail that it was accepted, otherwise it has only been a few days between the two messages. None of the articles I've had held over have been rejected later... so far. I want to submit something for a pet day/certain event day, how far in advance should I send in my work? About two weeks early is fine in my experience. No worries if you're earlier... I'd say a week before at the latest. My entry got accepted! OMG I'm so happy! Will I be getting lots of fanmail and stuff? In regards to fan mail, I can't really say. I guess it all depends on who/how many reads your work. Many people who read the NT don't submit any feedback, even if they enjoyed the story/article/comic. Others make sure to let the writer/author know just how much their work is enjoyed and appreciated! To put it this way, I have recieved everything between 0 and 3 NeoMails about my articles since I started writing, so either my work isn't very enjoyable, or very few people read it, lol! On this note, thank you SO much to every single person who has said kind words to me about my work, it means a lot! You can read some of my fanmail below. I haven't screenied them all as I've purged my inbox before saving all of them, but they're all deeply appreciated. I want to thank every one who has sent me a NM about my work in the NT, I truly appreciate it, thank you so much! It really warms my heart. Below you can read my articles. They are sorted in the order they were published. My first published colour-related article. This was fun to do, I love Royal pets (although I deeply miss how they all used to look) and had fun bringing the less appreciated ones into the spotlight. Am I a big fan of Mutant pets? Not really. Did I enjoy writing this? Oh yes! There are actually a few Mutants I really like, and you'll find them all in here. This is probably the article I am most happy about so far. My Faerie Quiz! This was so much fun to put together, as Faeries are one of my favourite things about Neopia. I hope you enjoy taking it! To my dismay, I made several errors in the formatting of the quiz, such as a question and the first option are on the same line. My writing program messed it up a little, and I wasn't thorough enough in checking the text after pasting it into the submission form. It still got in though, yay! Another colour article. As I'm very interested in Ancient Egypt, The Lost Desert (both the world and the paint brush) are naturally inspiring to me. In this article I chose to not focus on all the most popular Desert pets, but rather mix it up a bit in terms of their outfits and base colours. This is why you won't find Draik, Cybunny and Aisha in this one. Like I've stated earlier in this guide, try to take the path less travelled by. The fact that my pirate article was published in issue 666 made me smile. (Sorry, I have a weird sense of humour). Again an article about a paint brush, but like I've said, I'd rather write these than to focus on a single species. I much prefer pirates to ninjas (I mean... Stealthy pets!) so this was an enjoyable piece to work on. Below you can visit my other petpages! Glitters: This page (and several others which you'll find links to on this page) hosts my glitters. I have glitters of pets, UCs, items, Neopian characters, etc. Requests are always open! I can even glitter your pet complete with background and wearables. This is a customisation guide slash directory of Chocolate and food coloured pets. The guide is meant to inspire those who wish to customise their choco pets within a candy/food theme. It features all species and is divided into different categories, such as holidays and NeoPoint wearables. All the customisations are put together by me, and there is a list of users who have added their own pets to the closet as well. You can NeoMail me to have your pet added if they're Chocolate, Jelly, Biscuit, Custard or Strawberry. Their customisation doesn't have to be in a food/candy theme! This page features my custom shields. NeoMail me anytimee to request one, just tell me which shield colour you'd like plus the image you want and text (if any). Thank you to the kind users on Charter who have helped me answer my questions, you guys rock! Background and images: Standard Neopian Times background. Other images are from the NT and elsewhere on the Neopets site. Site banner and link button were both made by me, aleu1986.